The city has been at the centre of attacks for months due to the so-called anti Balaka who target the Muslim members of its population. “This morning (July 24, ndr.) 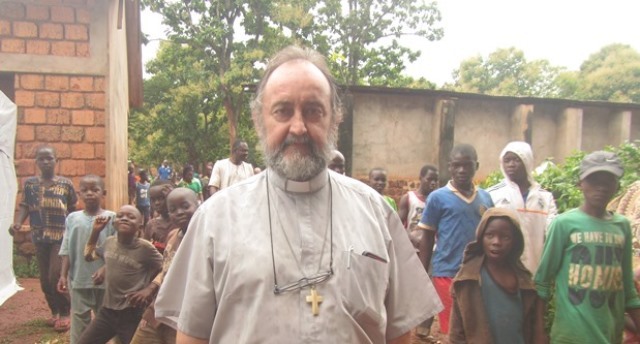 two anti-balaka attempted to enter the refugee camp but were rejected by MINUSCA and one of them was killed”, Mgr. Aguirre reports. “The Balaka group replied by attacking the Cathedral, which suffered material damage and wanted to set fire to it. Fortunately, they did not succeed,” continued Bishop Aguirre. “MINUSCA is trying to control the situation by sending patrols in the streets that shoot warnings, which cause panic among the population. Some people have died of heart attack, while others have been injured”, the Bishop reports. The bishop is calling for more effective UN support in protecting the population. A World Watch Monitor interview with Bishop Aguirre can be read by clicking here.